Alten Construction recently finished construction on the historic Napa County Courthouse. Construction on the $13 million project began in September 2017 and was wrapped up in January 2019. The facility had been closed since August 2014 following the South Napa Earthquake, which caused extensive damage to the historic courthouse. 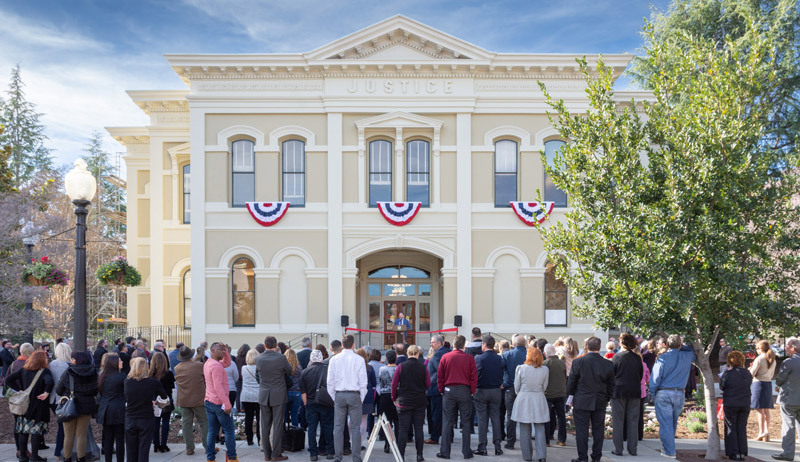 A grand reopening ceremony for the newly restored courthouse was held Jan. 22, 2019. The 18,000-square-foot structure consists of an 1878 historical building that had been unoccupied since the earthquake. An addition was later built and is still in service for the County Court. The repairs included deconstruction, structural, mechanical, electrical, fire protection and interior finishes. In addition to repairing the courthouse damage, the project also included the 16,000-square-foot courthouse historical renovation, structural repairs and reconfigured, ADA-compliant restrooms. Since the building was built in the 1870s, the entire structure was built with unreinforced masonry unlike today’s modern masonry, which has rods of reinforcing steel to keep it from collapsing. 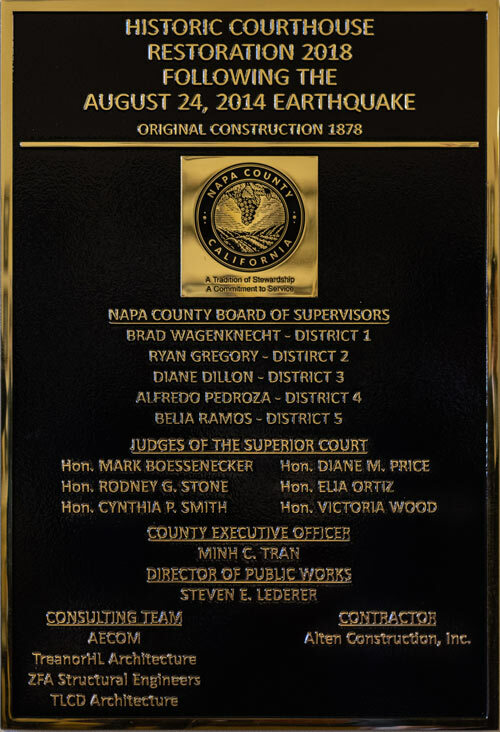 After the South Napa Earthquake completely destroyed some of the courthouse walls, the commercial construction company had to stabilize the building with steel beams and shoring prior to removing the existing load bearing structural walls that remained. In order to be able to reoccupy the building and make it safe in the event of another earthquake, Alten Construction had to structurally repair all of the unreinforced masonry using a Fabric-Reinforced Cementitious Matrix (FRCM) system. Their team also tore down the severely damaged old red brick walls and rebuilt them with new concrete masonry block walls. “It’s significant because this system is brand new to the U.S., and we used it on this historical project,” said Mitchell. For part of the project, Alten Construction was tasked with salvaging and reinstalling existing finished carpentry, including wooden railings, wainscoting, windows, doors and framing. Alten Construction utilized modern technology, including a Matterport 3D camera, to complete an in-depth comprehensive survey of the entire building, marking each piece and putting it on a plan, so it would be placed back in its exact location. The construction company brought back all of the finished carpentry and wooden benches for the courtroom, back to its shop in Richmond, Calif. where the restoration occurred. During the process, Alten Construction removed lead paint, sanded and repainted all of the finished carpentry and wood. Located at 825 Brown St. in Napa, the Historic Napa County Courthouse is the fifth oldest continuously operating courthouse in California. The courthouse was built to replace the original 1856 courthouse and continues to serve as the seat of Napa County government.